A recent trip to the Wizarding World of Harry Potter at Universal Studios had me thinking back to my first Harry Potter memory and the treasure trove of descriptive language found in the series. Do you have an early Harry Potter memory? Mine was the summer of ‘99. I heard Oprah Winfrey talking about a book that had adults and children alike clamoring to read. As a fourth-grade teacher, I had to investigate. Of course, the book was Harry Potter and the Sorcerer’s Stone, and the rest is history. Now it’s 19 years later, and the seven books in the Harry Potter series have collectively sold nearly 500 million copies. They’ve been translated into more than 70 languages. Imagine how many children (and adults!) have enjoyed the story of the boy wizard! It was my 30-something daughter who invited me to visit the Wizarding World of Harry Potter at Universal Studios with her. In preparation for our trip, I reread Sorcerer’s Stone. I believe it was even more enchanting than the first read. If you have children in your life who haven’t been exposed to the Harry Potter books, I highly recommend them. Although the movies have been out for a while, and many kids think they have come to “know” Harry, nothing can replace the language in J. K. Rowling’s books. Have students close their eyes and conjure their own image while you read the passages aloud. This helps demonstrate the power of the author’s language. Next, ask students to write their own descriptive sentences or paragraphs. Topics can include pets (real or imaginary), special dinners, birthday parties, a favorite toy, a trip to the zoo, a favorite dessert, etc. Emphasize playing with the words to make writing come alive. This is a good time to practice using a thesaurus. Good writers use descriptive adjectives to show their characters’ traits. 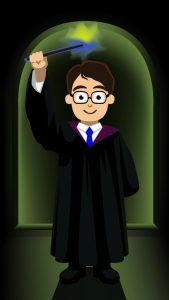 This link, ReadWriteThink.org, uses the characters from Harry Potter to help students identify character traits. Have students make a list of traits for characters from Harry Potter or any other book they are reading. Then they can complete their chart with actions that demonstrate the trait. Students can use the chart to show reading comprehension or to develop characters in their own writing. For more discussion ideas look at Scholastic Discussion Guide for the Harry Potter Series. This guide, written for the first 4 books in the series, deals with theme, setting, characterization, and conflict. The guide also includes discussion questions and vocabulary activities. Why not get interested students to form a book club and meet with other staff (a principal, counselor, cafeteria staff, custodian, etc.) or interested Harry Potter fan to discuss their reading? This is a way for students to connect with other adults as readers.